One of the most important things you do during puberty is discovering yourself, mentally as well as physically. But everyone does it in their own way, and this is what Aristotle and Dante discover the secrets of the universe focuses on. When I tell people I came out at the age of 25, most of them respond with” “Wow, that’s late!”. My own family responds to that mostly with: “The only person who didn’t realise was in that closet, was Linda herself.” It made me feel odd for a bit, like it wasn’t real if you didn’t struggle with the concept for many years or when you had some huge outing in your teenage years. I decided quite quickly that I wouldn’t listen to these reactions, that my life is my life and my journey is my journey. But still… And then I read Aristotle and Dante discover the secrets of the universe. And I finally felt like I had a story I could connect to. On one early and freezing cold morning our guide led us into the nature of the Limpopo region in South Africa. For weeks we had seen the most incredible animals and we were all curious about what we could see by travelling on foot for a change. There were no signs, there was no path, and all we saw for the first hour were rocks and trees. One of those rocks was our destination of the day, there were no animals that day. What we got to see, what our guide shared with us were the ancient spirits of South Africa. On this sole rock in the middle of nowhere the ancient San had once painted whole herds of kudu, springboks, humans, a hippo. And one sole giraffe. 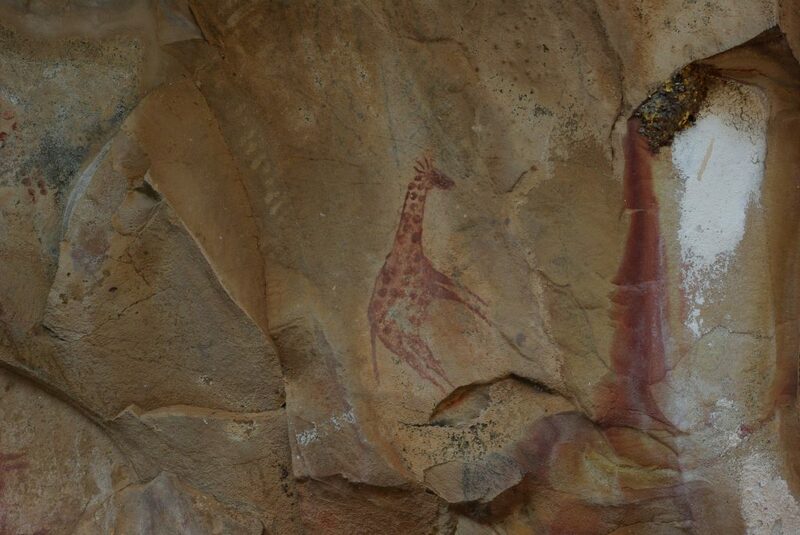 That giraffe was so incredibly lifelike with its long legs and red spots, and it was painted far away from the other animals. Giraffes are relatively solitary animals and the distance from the other paintings struck me as it captured the wandering spirit of this animal perfectly. Half of the pictures I took that day are of that lonesome creature. Recently I visited the famous site of the caves of Lascaux, a humbling and wonderful experience, where you can only see replicas to protect the original cave. It was a sharp contrast from this remote site in Limpopo where I easily could have touched the paintings if I wanted to, although our guide would have strongly scolded me if I did.